The Tokaido road is ready to unveil a few more treasures for the most faithful Travelers: cherry trees in full bloom, luxurious bathhouses, goodluck charms, calligraphy, legendary objects, and even clandestine gambling rooms are now part of the journey! The Crossroads expansion will open up new doors and many new possibilities to make the journey even richer and more strategic. (This expansion requires the Tokaido base game to play). 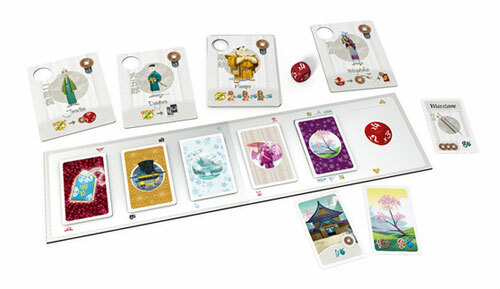 This expansion introduced new playable characters to the world of Tokaido that bring different play ability to the game. The expansion also brought in new actions you can take per space, so instead of always just doing the same thing, you now have a choice of what you want to do (there is even a character that will let you take both actions!) You can now gamble, pay money to get guaranteed 4 VP at the hot springs instead of a random 1-3, you can buy legendary items worth 9 points when shopping, and you can buy things that will affect the game, such as adding victory points if you’re the last to eat, or allowing you to eat for free. The expansion is mostly easy to learn once you understand all the second options now available to you, and really adds more fun to the basic base game. For the price, its really like a new game. The crossroads expansion simply adds new choices for each stop along the way. Now everywhere you stop you’ll have the choice presented in the base game, or you can choose to done a new thing. You can gamble at the farm. Pay to go to a bath house instead of a hot springs. Amulets and calligraphy cards change the way you score and play. You can buy legendary items at the village that will earn you more points. It’s very compact and adds a lot more decision making and replayability to Tokaido. I really like Tokaido. The expansion seems to alter the game quite a bit though. Often when you land on a space you know what you will get or do. With this expansion it really changes things up. Tokaido is not a game with dice, so the addition of a die to the game kind of changes up the experience for me. I like the calm pace of the game as it it. When the die is added I begin to feel that tension before I role it to ‘gamble’. The new options seem to change up the pace and make game play feel different than it ever was with the base game. Add a Review for "Tokaido: Crossroads"